This is another painting I did for my landscape class. 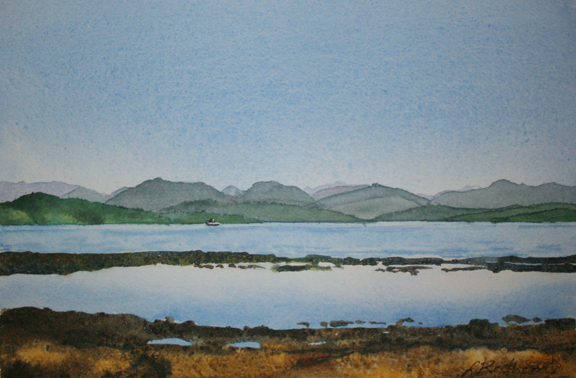 The image is from my travels to Quadra Island when I taught a workshop there. This painting was done last week and I am behind in my posts but life continues to be crazy. Do you want to know how crazy? Okay, here goes. After traveling to workshops throught Sept and Oct, I came down with the most depressing of flus. I say depressing because I didn't realize what I had. I was just exhausted and couldn't seem to stay awake. I felt like I was slogging through everything just trying to keep my eyes open! I thought that there was something seriously wrong with me and about put a call into the doctor after a week of feeling this way. But then I woke up one day with a runny nose and a bit more energy. For the next week I had a cold and the exhaustion seemed to be going away. Funny how that happened. Now I am trying to play catch up for the past 2 weeks of not being completely myself. I have a 15 page paper due for my Masters thesis (had to ask for an extension), classes to prepare for, a painting that absolutely needs to be finished, a huge demo next week, and two 2 day workshops that are back to back starting on the 12th. Plus it is Halloween. Pumpkins need to be carved (late, I know!) and trick or treating. Then my son tells me that he has to bring chips and fruit to the party today. Thankfully I found a bag of Tostitos and a few apples I tossed into his backpack. Didn't even slice the apples. Good thing he didn't care to wear the costume to school this year. 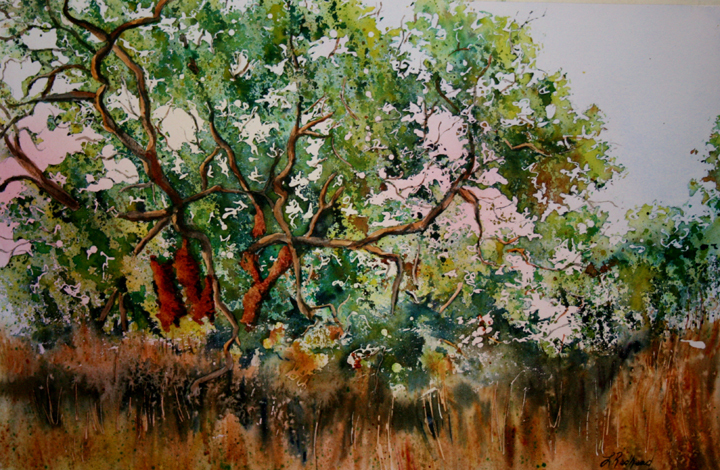 Wild Oak is a painting I did with my Wednesday class at the Kerrisdale Centre. Another fun splatter technique. Last night was my demonstration for the Artswest group out in Surrey, BC. I decided to try something new for one of my demos. 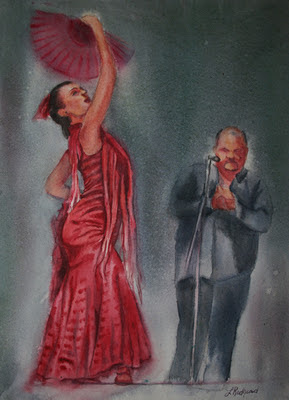 That was painting a flamenco dancer wet-in-wet. Plus the photo was not the best to work from. I am usually asked to demo a portrait or pouring. But I wanted to challenge myself even more. And what a better time to do that than in front of a large group of accomplished artists. Ha! All in all, I felt like it went well. Thank you to Artswest for the opportunity to demonstrate! 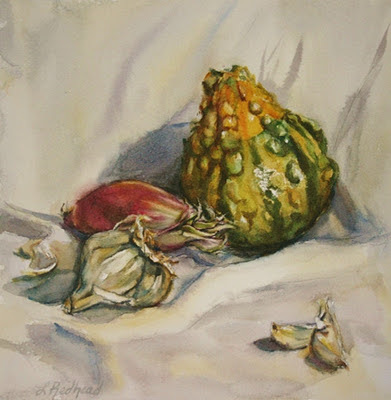 The first two days of my workshop with Mary Whyte was spent doing still lifes. Then we moved on to the really exciting part- portraits and figures!! I haven't painted from a model for many years so it was nice to get back to it. I forgot how much I enjoyed it. The first painting I produced didn't make the cut. 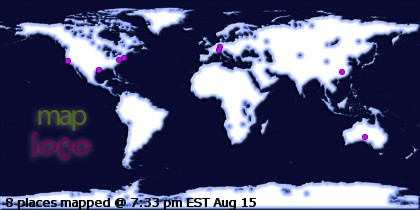 The second one will hopefully be shown later. I want to make it a finished piece. Rain is from my final day of the workshop. The model was dressed in a rain slicker and an umbrella. Since we had only a few hours to complete the painting, I felt like I had nothing to lose and jumped right in. After five full days of painting, I now feel more comfortable using the cat's tongue painting and painting from a model. Mary was extremely generous with her talent and her time. I definitely feel like my experience will move my work to the next level. And I can't wait to discover what that will be! Now I must go paint. 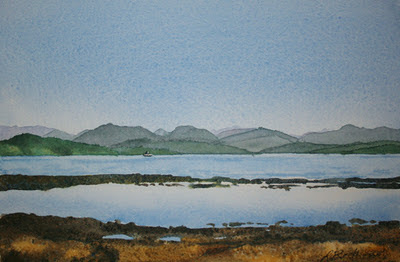 I just returned from an amazing week learning from The Watercolor Goddess, Mary Whyte. 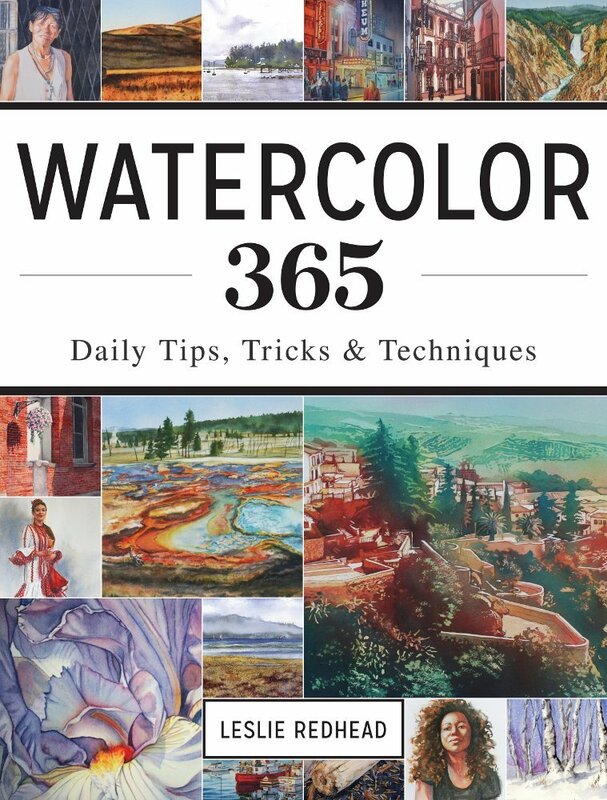 It was five intensive days of painting from life and trying to absorb many gems of watercolor wisdom. This opportunity came about because of my dear friend Sam who arranged for a group of us to go to Whidbey Island for the week. Mary requested a few things from the group from the beginning. They were that we each produce a really bad painting and that we push ourselves to try something new. I not only produced a bad painting, but was able to produce a few. Those made into the circular file never to be seen again. As for the second request, I felt like I tried several new things. First of which was to use a cat's tongue brush. The second was to paint a portrait from life in watercolor. 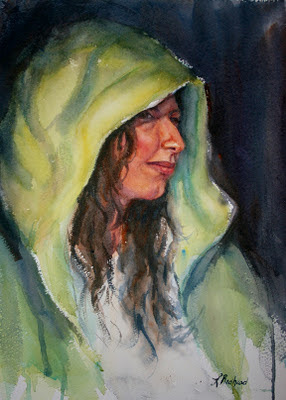 I have painted portraits from life in oil and acrylic but not watercolor. 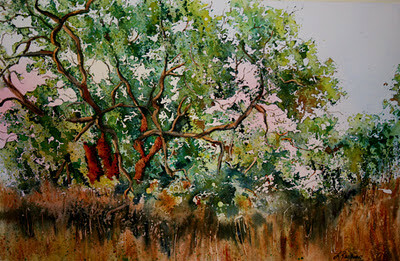 I have also painted plein air in watercolor but not a portrait. Odd for me since I love watercolor so much! The first couple of days were spent doing still lifes. The above painting is my attempt at painting produce from the local market. Below is a photo of Mary with me and the rest of the gang.